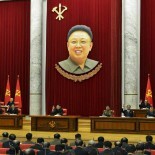 Over the weekend, Kim Jong-il conducted a guidance tour of the “newly-built” DPRK Central Court in Pyongyang. General-Secretary Kim visited a historic exhibition and was briefed about the construction of the new court building (s). He remarked, “that the court has developed into a weapon of class struggle and one of proletarian dictatorship under the wise leadership and meticulous care of President Kim Il Sung.” Like many practicing attorneys in the West, it is likely this is the closest General-Secretary Kim will be to seeing the inside of a courtroom. There are no known photographs of this visit (as yet). A new Central Court facility has many implications for Pyongyang watchers to hash out. The new Central Court building (s) certainly has the fingerprints of Jang Song-thaek. This blends capital city construction with the internal security apparatus. The new Mansudae Street apartment complex, the Taedonggang Combined Fruits Farm of the MPS, refurbishment and restaurant additions on Kwangbok Street are all Jang-initiated projects. They are also likely indications of Mr. Jang’s political clout. This entry was posted on 01/25/2010 by nkleadershipwatch in Administration Department, DPRK Cabinet, DPRK Central Court (Supreme Court), Guidance Tours, Jang Song-thaek, Kim Jong-il, On the Spot Guidance.